After several weeks of preparatory work, Bouygues Travaux Publics' teams have conducted the first concrete pouring the 30th of November. 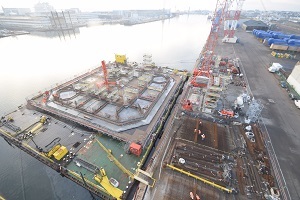 This operation has consisted in the pouring of the floater's bottom onto the construction barges installed at Quai des Charbonniers, Saint-Nazaire. A new symbolic step has indeed been undertaken with the beginning of civil works activities, which will continue until next spring in order to achieve the construction of the 36 square meter platform.